Project Unpack invited veterans to “unpack”—or explore—their experiences at war and at home through music, fine art, and story. Image courtesy of Project Unpack. 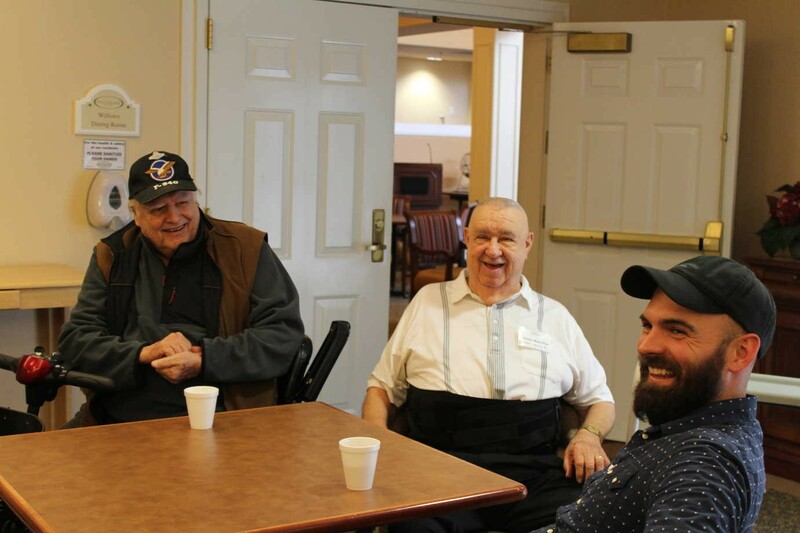 A program funded by the NEH, Project Unpack offered veterans from the Fargo-Moorhead area the opportunity to share their stories and reflect upon their experiences through a variety of media. The program was initiated by Christina Weber, a professor at North Dakota State University who knew from her personal experience in a military family and her research that war has lasting effects on veterans and their communities. Project Unpack quickly expanded, becoming an effective collaboration between NDSU and local veterans. Project Unpack helped veterans make connections across generations. Here, two Vietnam veterans engage in lively conversation with Josh Zeiss, an artist and veteran of Iraq. Image courtesy of Project Unpack. 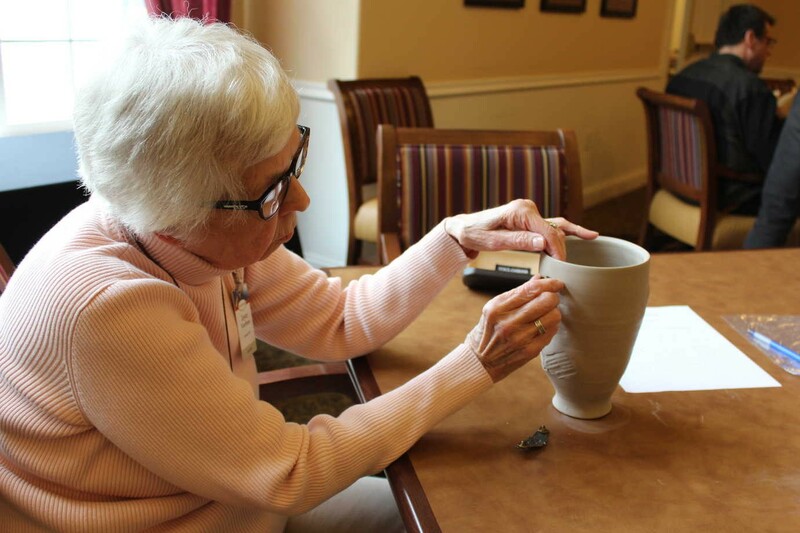 Project Unpack brought art workshops to assisted living centers. There, veterans and their families used personal mementos to make works of art while reflecting on their experiences. Image courtesy of Project Unpack. Project Unpack provided a series of interactive activities over the course of 2016 and 2017, all themed around the idea of “unpacking” or “[talking] freely about complex topics such as life in the military, the experience of war, the return home, and readjusting to life as a civilian.” Public programming included lectures and workshops on storytelling, memoir, and ceramics, during which veterans were able to tell their stories through a range of artistic mediums. 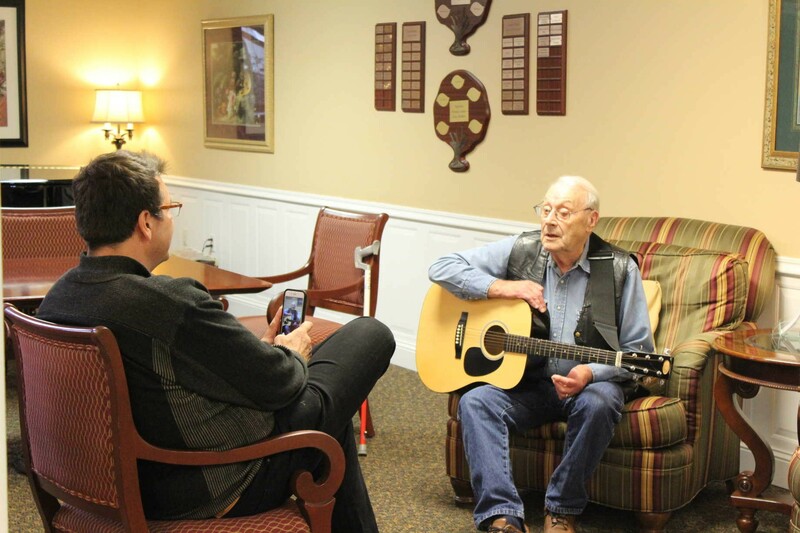 Programs at local retirement homes reached a number of World War II veterans. 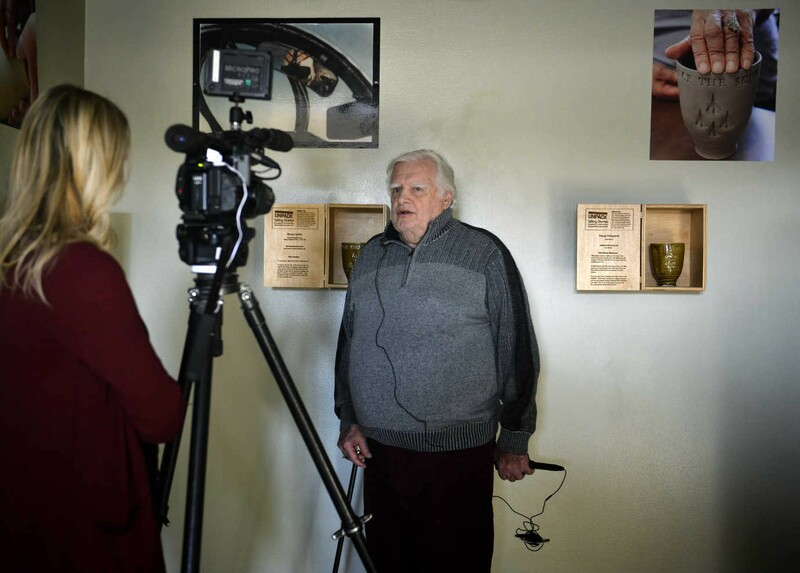 And, as part of a collaboration with Prairie Public Radio, NDSU students worked with veterans to collect their oral histories. These will be archived in the university library as well as hosted on Project Unpack’s website. 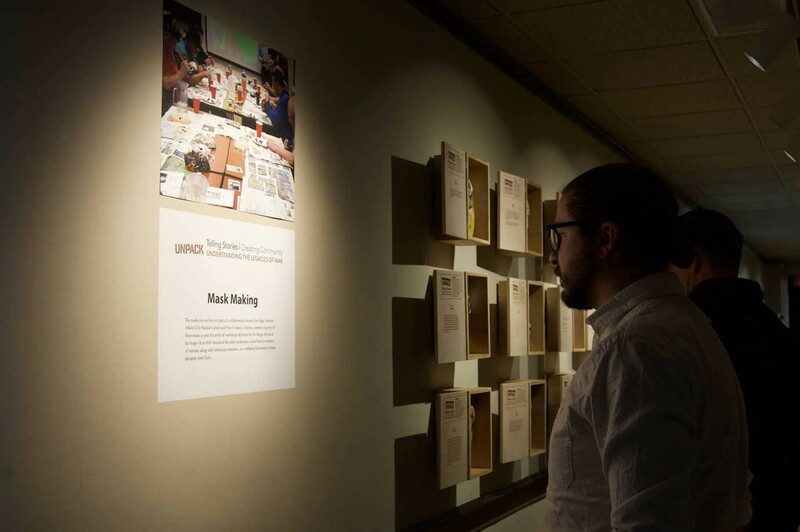 Project Unpack concluded with an exhibition at a local art museum, where veterans shared the works of art and memoir they created during the program. Image courtesy of Project Unpack. A veteran discusses his contribution to the exhibition. Image courtesy of Project Unpack. Many of Project Unpack’s events attracted large audiences of veterans and community members. More than 500 people, coming from all parts of North Dakota and Minnesota, attended Tim O’Brien’s lecture on the legacies of war—these included several groups of K–12 teachers and their students. In a work of public performance art, Iraq War veteran Josh Zeis retraced a 20-mile walk he took upon learning he was going to war in 2007, all while carrying a 100-pound military rucksack made of ice. This performance inspired public conversations on military experience and war’s lasting effects, including several pieces in the local news media. Finally, Project Unpack closed with a multimedia exhibition at the Rourke Art Museum, where veterans were invited to share their works of art and memoir.